We used to affectionately call him "Wes the Mess" because of his inept ways of setting gigs up.One time The Jars, the Mondellos and others bands arrived to play downtown Berkeley's Provo Park on July 4 1979 and Wes was the promoter. After the bands started to set up we realized there was no electrical power! Someone had to get a bolt cutter to break into the power box. He really was a great guy but we always wondered what kind of dope he was on and if we could get some. Ruthie's Inn was a trip and he was special to the Bay Area punk scene. Him and Dirk ,gone within months of each other. Wes Robinson founder of the legendary Ruthie's Inn on San Pablo Avenue in Berkeley, California — a mecca for San Francisco Bay Area thrash metal and punk acts in the 1980s (everyone from BAD BRAINS to SOCIAL DISTORTION, then later METALLICA, EXODUS, POSSESSED and DEATH ANGEL, played there) — passed away on December 31, 2006, reportedly after having fallen down a flight of stairs of at his studio in Oakland (although the cause of his death has not yet been officially released). Robinson was 77 years old. 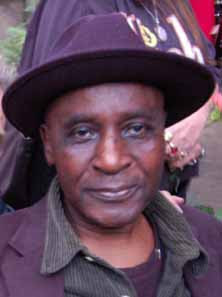 Shortly before his death, Robinson was working on a documentary about Ruthie's Inn, featuring footage shot at a Ruthie's Inn "reunion show" (flyer), which took place on September 23, 2006 at Nimby Warehouse in Oakland. Performers at the concert included FANG, NO ALTERNATIVE, SOCIAL UNREST, VERBAL ABUSE, ALL TIME HIGHS, ARNOCORPS, STONE VENGEANCE, and PROUDFLESH." Wes was a Trip. Nice guy, I saw him at Dirk Dirksen's Memorial in Dec. 2007, then BAM, Wes was gone too. I wonder what's happened to the footage he was compiling?, I'd love to edit it together for his memory at No Cost.